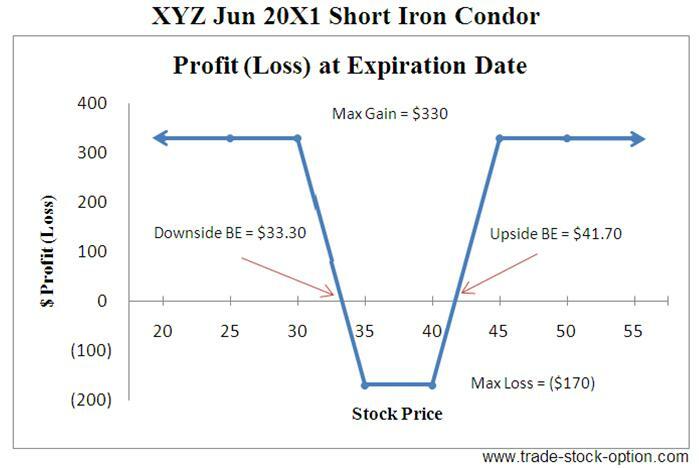 Short Iron Condor is one of the volatility strategies employed in a highly volatile stock. It is usually a four-legged spread option strategy using a combination of both puts and calls options with the same expiration date but different strike prices. Typically the distance between the strike prices for the various options are equal for this strategy. Unlike the regular butterfly spread, shorting (selling) an Iron Condor is created by using a combination of puts and calls options instead of all calls or all puts options. 1 Narrow Long Strangle (Long middle strike puts and calls) + 1 Wide Short Strangle (Short OTM puts and calls). You are expecting an increase in volatility of the underlying stock price. However you are not concern on whether the stock will move in which direction. Limited to the amount of Net Premium Paid for the various options entered. (May loss 100% of amount invested in this option trading strategy). Limited to the different in adjacent strikes less net premium paid when the stock is between the two middle strike price (at expiration). Downside Breakeven = Middle Long Put Strike less Net Premium Paid. This is typically a net debit trade as you are combining two debit spread: Bear Put Spread and Bull Call Spread at the same time. Limited risk exposure when the underlying stock is between the two middle strike prices on expiration date. Pay double (or near double) premium to a stock that is expanding in volatility. Remembering that Short Iron Condor is a combination of other strategies, you can also unravel the spread in two legs. In this way, advance traders can create bullish, bearish, sideway or volatility strategies based on the underlying stock’s movement. Assumption: XYZ is trading at $37.10 a share on Mar 20X1. The verdict of a legal law suit against the company is expected to be made soon. You are expecting share price of XYZ to soar up or plummet down once the verdict is out. You would like to profit from the volatility of this stock with limited risk exposure and lesser cost outlay than a Short Iron Butterfly strategy. In this case, you may consider to sell one Jun 20X1 $30 strike put at $0.30, buy one Jun 20X1 $35 strike Put at $1.40, buy one Jun 20X1 $40 strike call at $1.00 and sell one Jun 20X1 $45 strike call at $0.40 to profit from the volatile outlook of the stock. Note: commissions are NOT taken into account in the calculation. Typically the strike prices between the options legs are equal. However if you have a stronger view in one of the direction, you do not need to space them equally apart. You can weight more toward calls versus puts, or vice versa, by tailoring the position according to your view of the underlying stock and the risk-reward parameters. Before you executed a Short Iron Condor strategy, you must first determine at which price the underlying stock will most probably NOT be trading at the expiration date. This is the price that will be in between the two middle strike where you purchase the puts and calls options. Next sell a lower strike put option and a higher strike call option of the same expiration date. These two short options help to reduce the cost of the two long options. A Short Iron Condor is typically a bet on the volatility expansion. Verdict of law suit, product announcement, earning or economic reports do have a tendency to move the stock price sharply up or down. The maximum profit will be earned, at the expiration date, when the underlying stock moves beyond one of the breakeven points in either direction. The maximum loss will occur when the underlying stock close in between the two middle strike prices at expiration day. This is a net debit trade as you are paying the premium for both the puts and calls spreads. The risk is that the stock is trading range bound or the move is not big enough to push the stock price beyond the breakeven point during the trading time frame, forcing both the puts and calls debit spread to decay in value. Therefore it is preferably to use this option trading strategy with at least 3 months left to expiration so as to give yourself more time to be right. An Iron Condor strategy is a good strategy to deploy in your arsenal of trading strategies. You should pick the strike price and time frame of the Short Iron Condor according to your risk/reward tolerance and forecast outlook of the underlying stock. Having the patient to wait, knowledge to apply and discipline to follow through the option trading strategies with appropriate risk-reward parameters is important to your long term success in option trading.